It is not always easy to remove a manhole cover from over drainage inspection chambers because the cast iron covers are very heavy and if they have not been removed for years there will be rust and soil around the edges. 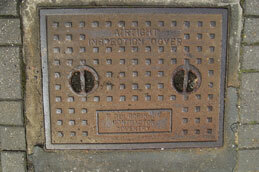 Many domestic manhole covers tend to be oblong and these are usually quite easy to lift up, though sometimes they are round and can prove slightly more difficult to remove. Use a screwdriver to scrape around the edge and then gently tap around it with a hammer, this should help to loosen it. Should it still prove stubborn you can tap the cover gently with a piece of wood until vibration frees it. Once loosened, use a screwdriver to lift it slightly and then insert a spade under one edge until you can lift it clear. Sometimes special keys are used to remove the cover, if that is the case usually a strong hook or piece of bent steel will serve just as well. If the cover is secured by screw type bolts, be prepared to use penetration oil before attempting to use a wrench or spanner on them.